If like us, you don’t want to take the time to learn Photoshop but like turning ordinary photos into wacky bits of art, have we got the program for you. It’s Ashampoo Photo Card, and oh boy, is this fun. 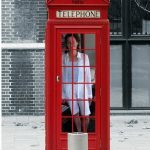 We put Joy’s sister into a British telephone booth, Joy’s face on a skyscraper, and Bob’s reflection in a mirror above a chest of drawers. We saved the results to disk so we could print them out, but these and dozens of other designs can be emailed, posted on Facebook or shown off on the Ashampoo website. The basic task is to click on a template and open a photo to drop into the design. Or you can use your computer’s camera to take a current picture. Both worked well for us. From there, you can add text and send it off or make changes. Fonts can be changed, objects can be moved around, and when you click save to disk, the image opens up in the free Google Picasa, or your default picture editor, for further editing if you wish. We used Picasa to save it under a custom name, to make it easier to find later. Ashampoo Photo Card has a free 40-day trial; click “downloads” at ashampoo.com. For now, the introductory price is $8, but it will go up to $20 in the near future.